(2015) Shambhala Online has become an essential arm of practice and education within the Shambhala Mandala. Its mission is simple: to use technology to connect teachers and learners. From its early focus on the transmission of talks by the Sakyong and advanced teachings for Vajrayana students, Shambhala Online now offers Acharya-led courses for students at every level along the path. Online is entirely self-supported through program subscription, and shares revenues with the center mandala and the teachers who participate. 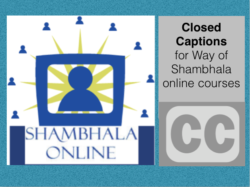 Through the simple and inexpensive application of newly available technology, the online teachings could be made available to students with disabilities, and create a multi-lingual platform for centers in Europe and Latin America where a shortage of teaching resources is compounded by Shambhala’s anglo-centric language barrier. This proposal focuses on Phase I: to caption – in English – the complete â€œWay of Shambhalaâ€ teachings and Phase II and beyond: English captions become the basis for translation into other languages spoken within the global community.